It's no secret that I love to crochet. A fact that may be a little less known about me is that I try not to have any regrets. Yes, there are things in my past that I wish I would have done differently, but that doesn't mean I regret doing those things. Many of them, if they never happened I wouldn't be where I am today, married to a great man with two of the best kids ever. But today I realized there is one thing I regret. It is no secret that I have an Etsy shop. 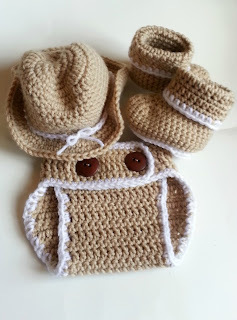 I love to crochet things for friends and family, but often times I come across patterns that are so adorable I just have to make them and I have no one to gift it to. One of those more recent items is a crochet cowboy hat. A friend posted a picture of one on my Facebook timeline a while ago. I took that picture as a challenge. you think it's cute. I think it's cute. Dammit, I'm going to find a way to make it. I searched the interwebs for days. Maybe weeks. And then I finally caved and bought a pattern. After many failed attempts, I think it's safe to say I have mastered this teeny hat. 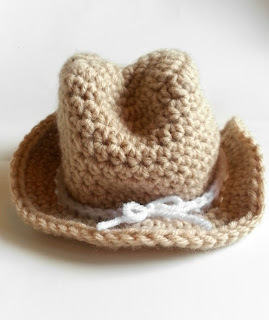 Through my large collection of patterns, I have also made itty bitty cowboy boots and a matching diaper cover. This is where my regret comes in to play. If I learned how to crochet much earlier than I had, our kids would have had the cutest newborn pictures. Ever. Stuff like this would have exponentially increased the chances of our kids having newborn pictures. I plead the fifth on if they actually do have professional newborn pictures or not.